Local fortnightly newspaper, Lannathai News, celebrated its second anniversary with a party at Kad Suan Kaew on June 1, presided over by deputy Chiang Mai governor, Pairoj Saengphuwong. The Chiang Mai Mail’s team, led by editor Phitsanu Thepthong, 3rd from left, are shown presenting a gift to the Lannathai News editor, Nopniwat Krailerg. Praphan Kodpetch, 3rd from right, the general manager of the Imperial Mae Ping, together with his PR team at the launch party for the hotel group’s new promotional campaign, at which local media and representatives of local businesses were welcomed. L’Oreal’s ‘Beauty Ambassador’ Ketmanee Wattanasin, (wearing white), star and mother of 3 children, is being welcomed by Robinsons’ marketing manager, Siri Sethakomut, and L’Oreal’s senior manager, Sachol Wuthipongsathorn, to the L’Oreal Day promotion held May 31 at the shopping complex. 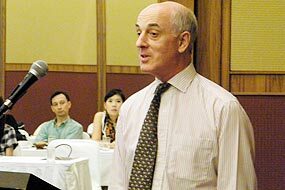 Ian Bushell, the director of Mentor International Institute, at the Kantary Hills Hotel on May 24, during his talk on preparations for further study in the United Kingdom. After the talk, the director and his supervisor, Nattakul Kuldilok, distributed informational material to prospective students and their parents. 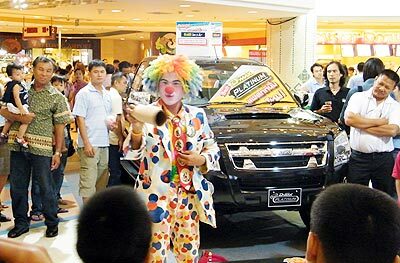 Central at Airport Plaza was the scene on the May 29 weekend of ‘Isuzu Wonderful Day’, organised by Isuzu Chiang Mai’s GM, Wichai Sin-anantpat, with performances and fun events.